Pythium insidiosum is the etiological agent of pythiosis, an emerging life-threatening infectious disease in tropical and subtropical regions. The pathogen is a fungus-like organism resistant to antifungal therapy, for this reason, most cases need extensive surgical debridments as treatment, but depending on the size and anatomical region of the lesion, such approach is unfeasible. We investigate the fungicidal effect and toxicity of crude bark extract of Stryphnodendron adstringens and commercially available tannin on Pythium insidiosum both in vitro and in vivo. Standardized fragments of mycelia of fifteen isolates of P. insidiosum were tested with different concentrations of bark extract (10 to 30% v/v) and tannin (0.5, 1.0 and 1.5 mg/mL). For in vivo study, fifteen rabbits were experimentally infected with zoospores of P. insidiosum and treated by oral and intralesional applications of bark extract and tannin. Acute toxicity tests with both substances were also performed in rats. In vitro studies showed fungicidal effect for both substances at different concentrations and the SEM showed alteration on the cell wall surface of the pathogen. All infected rabbits developed a firm nodular mass that reached around 90 mm2 ninety days after inoculation, but neither the intralesional inoculation of tannin, nor the oral administration of crude extract and tannin were able to promote remission of the lesions. Lesions developed by rabbits presented an encapsulated abscess being quite different of naturally acquired pythiosis, which is characterized by ulcerated lesions. Since no toxicity was observed in rats or rabbits inoculated with these products, while in vitro experiments showed direct antifungal effect, therapeutic activity of S. adstringens and tannin should be clinically tested as an alternative for healing wounds in naturally acquired pythiosis. Pythiosis is caused by the oomycete Pythium insidiosum in different animal species mainly in tropical regions. One of the most important differences between oomycetes and true fungi is the absence of ergosterol in the cell membrane of oomycetes that may explain the failure of conventional therapy since most antifungal drugs acts on this cell compound . Lack of an efficient treatment against this pathogen has stimulated the search for new potentially useful compounds including natural products. One of the pioneering studies using natural compounds against P. insidiosum was conducted by Zanette et al. , who showed that garlic extract is able to inhibit the zoopospores filamentation. Stryphnodendron adstringens, popularly called barbatimão in Brazil, is a common medicinal plant found in Brazilian Cerrado region . This species belongs to the family Fabaceae and it is widely used in traditional medicine for diarrhoeas, gynaecological problems and for wound healing . In addition, antimicrobial, anti-inflammatory, antiulcerogenic and wound cicatrizing properties of bark extract have been reported [5–8]. These effects are attributed to the major compound, tannin, found in the barks and leaves of this tree that shows fungicidal activity against Candida albicans, Candida spp., Trichophyton rubrum and Cryptococcus neoformans [3, 9, 10]. Based on these previous reports, we hypothesized that S. adstringens has bioactive compounds that could be able to fight P. insidiosum. Therefore, in this study we evaluated the effect of both crude bark extract of S. adstringens and commercially available tannin on the in vitro growth of P. insidiosum, as well as their in vivo activity in experimentally infected rabbits. Stryphnodendron adstringens barks were collected in Rubião Junior district (Botucatu, SP, Brazil, 22°52′60′′S and 48°28′60′′W), during the morning period. Voucher specimens were deposited at the Herbarium of the Department of Botany, Institute of Biosciences, UNESP, under the number 026633 BOTU. A crude extract was obtained according to Betoni et al. . Briefly, S. adstringens barks were dried, ground and extracted with 70% methanol at 4–8 °C and filtered after 48 h. The residual plant material was re-extracted with methanol 70% and filtered after 24 h. The extract was concentrated in a rotary evaporator at 45 °C for elimination of methanol and kept in sterile flask under refrigeration until use. Levels of total tannin in the extract were measured according to Waterhouse , as follows: 10 mg of the extract were dissolved in 50 mL of distilled water, and a 2 mL aliquot was mixed with 2 mL of Folin–Ciocalteu reagent and homogenized. Three minutes later, 2 mL of 8% sodium carbonate solution were added to this mixture, stirred and kept for 2 h at room temperature. Then, centrifugated at 2000 rpm to measure total levels of tannin. The analytical calibration curve of commercially available tannin (Sigma-Aldrich) was estimated by the absorbance at 725 ηm of 10, 20, 30, 40, 60 and 80 µL/mL. Fifteen isolates, obtained from clinical cases in human (B-01) and equines (Eq-2 to Eq-15) occurred in São Paulo State, Brazil, were maintained in Sabouraud (SAB) Agar, at 37 °C/7 days. After this period standardized mycelia fragments of 5 mm of diameter were tested with different concentrations of bark extract and purified tannin. Ten to 30% of bark extract were added to 1.0 mL of SAB broth and P. insidiosum hyphae standardized fragments of mycelia were added to these solutions. These fragments were incubated under shaking (100 rpm) at 37 °C/24 h. After that, each fragment was placed individually in SAB agar plates and incubated at 37 °C/7 days in order to follow the hyphal growth and determine the minimal fungicidal concentration (MFC). All tests were performed in quintuplicate. Tannin was tested at concentrations of 0.5, 1.0 and 1.5 mg/mL using the same procedure described for bark extract. Control groups consisted of hyphae standardized fragments incubated in SAB broth and placed in SAB agar. Hyphae fragments at MFC, were cut and fixed with 2.5% glutaraldehyde and then routinely processed for analysis by scanning electron microscopy (SEM) aiming to evaluate the hyphal morphology. In order to investigate whether bark extract and tannin administration by oral route would be toxic, we employed the test of acute toxicity, according to Loomis & Haynes . Briefly, we administered 5 g/Kg of bark extract or tannin, by gavage, in male Wistar rats weighting 250 g. For this assay 15 rats were divided in 3 groups and treated with bark extract, tannin or saline solution (control). Animals were observed for five days, when they were anesthetized with zolazepan chloride (Zoletil® 50, Virbac) and euthanized by anesthetic overdose. Blood was used to analyse serum levels of liver and kidney biochemical markers (ALT, AST, alkaline phosphatasis and urea) and complete hemogram. Liver and kidney were also excised and fixed in 10% formaldehyde and routinely processed for histopathological analysis. Rats were kept in cages (5 animals/cage) in the animal facility of the Department of Microbiology and Immunology, Institute of Biosciences, UNESP, and all procedures were approved by the local Ethics Committee on Animal Use (protocol number 536). Fifteen New Zealand rabbits were inoculated with 2 mL of induction medium (as described according to Mendoza and Prendas  containing around 20.000 zoospores of P. insidiosum), in the occipital region, as described by Pereira et al. . Thirty days after inoculation, the animals were separated into five different groups with 3 animals each for treatment as follows: S. adst. = bark extract by oral route (90 mg/day); TAN = intralesional tannin (30 mg/mL each 48 h); TAN-VO = tannin by oral route (60 mg/day); TAN-PRED = intramuscular injection of methylprednisolone (1 mg/Kg, once a week) and intralesional tannin (30 mg/mL, associated with 1% DMSO, each 48 h), and control group (no treatment). Association with DMSO aimed to enhance the tannin diffusion while methylprednisolone was administrated at anti-inflammatory dose. The treatments were followed by macroscopic visual inspection and palpation, and histopathology analysis of HE and Gomori-Grocott stained slides. Transverse and longitudinal lengths were also measured with a caliper to calculate the wound area (mm2). Infected rabbits were also analyzed on hepatic and kidney functions through the quantification of biochemical parameters (AST, ALT, alkaline phosphatasis and urea), as well as complete hemogram. Stomach and duodenum of animals treated by oral route were histopatologically analyzed. Rabbits were kept in individual cages at the animal facility of the Departments of Microbiology and Immunology, Institute of Biosciences, UNESP, and all procedures were approved by the local Ethics Committee on Animal Use, UNESP (protocol number 370). Crude bark extract showed 46.14% of total tannin concentration, which amount was considered for the serial dilution to determine the MFC (Table 1). Three out of 15 P. insidiosum isolates (20%) required more than 1.5 mg/mL; ten (66.7%) showed MFC between 1 and 1.5 mg/mL, while only two isolates (13.3%) required less than 1.0 mg/mL of bark extract to be inhibited. In relation of commercially available tannin, six isolates were inhibited at 0.5 mg/mL (40%), three isolates were inhibited at 1.0 mg/mL (20%) and six at 1.5 mg/mL (40%). Figure 1 shows the morphological features of hyphae of control group (Fig. 1A) with cylindrical body and smooth surface. Changes induced by bark extracts at MFC are illustrated at Fig. 1B, showing rough surface, release of anamorphic content and numerous granular material on the cell wall surface. Toxicity tests made in rats showed that S. adstringens extract, as well as tannin, presented no acute toxicity, since no changes were observed in biochemical parameters of liver and kidney functions or animal behavior. Erythrocytes and leukocytes countings were also similar to the control animals. Administration of bark extract or tannin solution in rabbits seems to be also free of toxic effects on liver, kidney and blood system (Table 2). All rabbits developed lesions at the inoculation site. Overall, the lesions appeared 20–30 days after inoculation and were characterized by encapsulated abscess with a firm consistency. Table 3 shows the mean size of the lesions before and at the end of treatment, indicating that there were no differences between the control group and any therapeutic approach we used. Macroscopic evaluation showed large granulomatous lesion containing caseous necrotic material with yellowish-green pus (Fig. 2). Microscopically we observed the typical eosinophilic granuloma with abundance of fibrous connective tissue and numerous hyphal elements evidenced by silver staining (Fig. 3). Antimicrobial activity of S. adstringens has been shown on Candida spp., Cryptococcus neoformans, some dermatophytes, viruses, bacteria and protozoa [3, 8–10, 16, 17]. It antimicrobial activity combined with the healing action leaded us to choose this medicinal plant to investigate its therapeutic potential against P. insidiosum and pythiosis. We first evaluated the in vitro effect of bark extract and tannin on this pathogen and observed that both were effective in inhibiting the mycelial growth. The tannin content in the bark extract was 46.14% and it was enough to inhibit the in vitro growth of pathogen. It has been reported that tannin may promote the precipitation of protein and/or polysaccharides, leading to formation of tannin-protein and/or tannin-polysaccharides complexes, justifying its antimicrobial effect . Morphological analysis by SEM revealed several granular precipitations on the cell wall surface that may be the polysaccharide complexes. Cell wall of this pathogen is composed mainly by β-glucan and cellulose (polysaccharides), which may be one of the targets for tannins. There is no standardized technique for in vitro studies of P. insidiosum and the few studies reporting tests of susceptibility of this pathogen were carried out with the zoospores, a form found in the environment [15, 19, 20]. Studies on the hyphal form of the pathogen are scarce and should be more stimulated, since they are simple and reproducible . Regarding the susceptibility of this pathogen to natural compounds, Zanette et al. observed that garlic extracts inhibited the formation of germinative tube in the zoospores of seventeen isolates of P. insdiosum. Krajaejun et al. observed that the volatile organic compound obtained from the endophytic fungus Musdocor crispans was able to inhibit the mycelia growth of thirty isolates of P. insidiosum. Sriphana et al. evaluated the roots of a traditional medicinal plant in Thailand, Alyxia schlechteri and found three new lignan esters, called alyterinates A–C [1–3], which had an inhibitory effect on hyphal growth, while terbinafine and itraconazole failed to show antifungal effect. Additional study carried out by these authors also found that the alkaloid clauraila E, obtained from Clauseana harmandiana roots, another traditional medicinal plant in Thailand, was able to inhibit mycelia growth . More recently, Suthiwong et al. found four new compounds from the fruits of Micromelum falcatum able to inhibit the mycelia growth of P. insidiosum. Fonseca et al. evaluated the effect of essential oils of Lamiaceae Family and observed that Origanum vulgare showed the best performance in inhibiting the germination of zoospores of P. insidiosum. Therefore, it seems that new compounds with potential therapeutic activity against pythiosis may come from nature. In this sense, Fonseca et al. showed that topical cream with essential oils of O. vulgare and Mentha piperita enhances the effect of immunotherapy to reduce the size of pythiosis lesions. Few studies on pythiosis were conducted both in vitro and in vivo. Pereira et al. evaluated the effect in vitro and in vivo of caspofungin, who administered it by intravenous rout and observed only fungistatic effect of this antifungal agent. Likewise, Loreto et al. evaluated the effect of diphenyl diselenide in vitro and in vivo administrated by oral route, and also observed fungistatic effect of this compound and no toxicity. 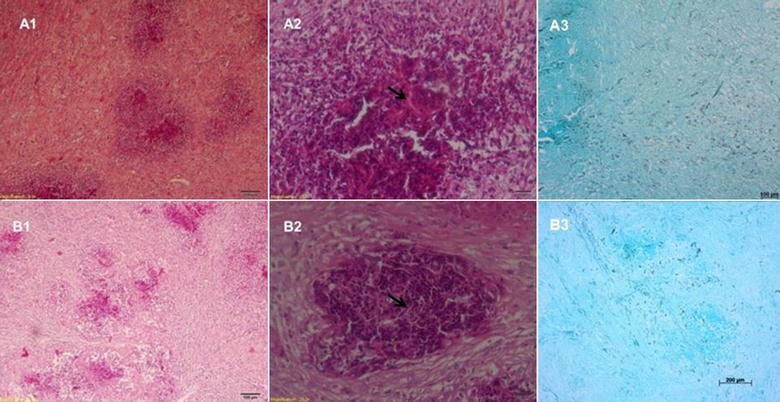 Our in vivo toxicological evaluation of bark extract and purified tannin in Wistar rats showed no signs of toxicity in the histologic sections of liver and kidney or biochemical parameters of hepatic and renal functions. No hepatic or renal dysfunctions were observed in rabbits either. These results are a little bit different of those reported by Costa et al. who evaluated the acute toxicity of different concentrations of bark extract in Swiss mice and rats, and observed more toxicological effects in mice than in rats. Despite of being very effective in vitro and showed no toxicity in vivo, the application of bark extract or tannin in the experimental model of pythiosis were not as satisfactory as expected. In all rabbits the main macroscopic aspect of lesion was of encapsulated abscess, with very rigid fibrous connective tissue. At necropsy it was observed caseous necrotic material with focus of yellowish–green pus, in agreement with Miller and Campbel , pioneers of experimental studies on pythiosis. We believe that this encapsulated abscess is the most important reasons for low perfusion of tannin administrated intralesionally, which provides a physical barrier to medications, even when associated with dimethyl sulphoxide (DMSO, a potent organic solvent used to facilitate the perfusion) and systemic administration of methylpredinisolone (used in anti-inflammatory dose). Actually, this barrier had difficulted the needle insertion for in situ inoculation of the solutions and should also avoid the perfusion of orally administrated substances. Therefore, an important difficulty for evaluating new approaches for treatment in vivo especially topical ones, is that lesions observed in experimental disease in rabbits is very different of naturally acquired disease. Horses and dogs, for example, develop ulcerated subcutaneous lesions, while in rabbits the lesions are well encapsulated in a fibrous abscess. Then, it is possible that the effectivity of S. adstringens extracts against P. insidiosum lesions would be observed in a more adequate model. Our results allow us to conclude that both bark extract and purified tannin have direct fungicidal effect on hyphal growth of different isolates of P. insidiosum. Despite we were not able to demonstrate a therapeutic effect in our experimental model, the abcense of toxicity in addition to the lack of efficient conventional medications for pythiosis, it would be ethically acceptable to test these compounds topically as alternative treatment of naturally infected horses and dogs. RT carried out all experiments and data analysis. RT, RK, AFJr and SMGB participated in the design of the study and in the manuscript writing. JMA, NRP and JLC collaborated in in vitro and in vivo studies, manuscript writing. VEF conducted histopathological analysis, manuscript writing. MJDS and WV performed tannin quantification on bark extract, manuscript writing. All authors have read and approved the final manuscript. The authors thank to Prof. Luiz Cláudio Di Stasi for suggesting the acute toxicity tests; to Carolina de Cássia Assumpção and Lara Vadrighi for lab assistance and animals care; to Ana Livia Ferreira Furtado for helping with quantification of tannin. Data will be shared upon request to the corresponding author smgbosco@ibb.unesp.br. The authors thank to São Paulo State Research Foundation (FAPESP, Grants: 2009/18466-0, 2011/14710-4 and 2011/21834-1) for the financial support and fellows granted. Sekhon AS, Padhye AA, Garg AK. In vitro sensitivity of Penicillium marneffei and Pythium insidiosum to various antifungal agents. Eur J Epidemiol. 1992. http://www.jstor.org/stable/3520676.